It can be hard, outside of the movies, to find date night activities that don’t revolve around food. Lately we’ve added card games to the mix. 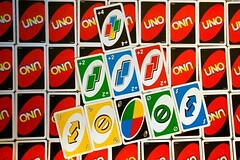 Simple games like Uno are still a lot of fun.